For those who find Juniper pricey for dinner — and it can feel that, with average mains in the mid thirties range — lunch can seem an absolute bargain. 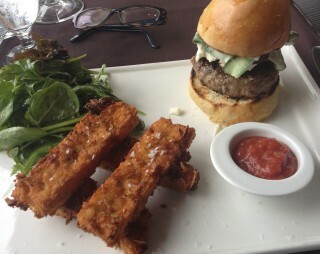 Lamb burger with greens and chickpea fries. Photo by Anne DesBrisay. About a year and a half ago, I reviewed Juniper’s take out boxed lunch (still available, from Tuesday to Friday) but today I’m seated in Juniper’s dining room. The sun streams in through the walls of window, in a big room that once showed off cars, and now shows off the cooking of chefs Norm Aitken and Peter Robblee. The food is very good, presentations elegant, and flavours are well matched. For noon-cooking of this quality, prices are very fair. Two dishes to tell you about. A lamb burger ($16) of exceptional flavour, swaddled in a tall bun, topped with pickled beets and a cucumber tzatziki. On the side, a pile of well dressed and seasoned greens, a pot of tomato ginger chutney, and a stack of chickpea “fries” (more delicious than they sound). 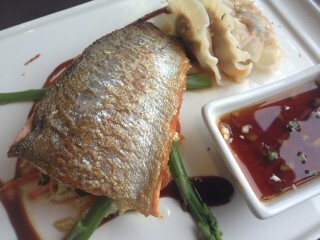 Trout two ways: crisp fillet and dumplings. Photo by Anne DesBrisay. A second dish ($17) features trout two ways: a filet, crisp skinned and moist fleshed, balanced on lengths of asparagus and a tart carrot-cabbage-scallion slaw sweetened with a hoisin drizzle; and smoked trout dumplings, served with a soy-sesame dip. This is a really good place to eat — particularly at lunch, when there’s an opportunity to tuck into some inexpensive and very fine dishes. Lunch mains $14 to $17. Open for lunch, Tuesday to Friday, daily for dinner (closed summer Mondays).